Pegmatite, with blue crystals of corundum. Pegmatite is a very coarse-grained igneous rock, with a grain size of 20 mm or more. Most pegmatites are composed of quartz, feldspar, and mica; in essence a "granite." Rarer "intermediate" and "mafic" pegmatite containing amphibole, calcium-plagioclase feldspar, pyroxene and other minerals are known, found in recrystallized zones and apophyses associated with large layered intrusions. Crystal size is the most striking feature of pegmatite, with crystals usually over 50mm in size. However, individual crystals over ten meters across have been found, and the world's largest crystal was found within a pegmatite. Similarly, crystal texture and form within pegmatite may be taken to extreme size and perfection. Feldspar within pegmatite may display exaggerated and perfect twinning, exsolution lamellae, and when affected by hydrous crystallization, macroscale graphic texture is known, with feldspar and quartz intergrown. Perthite feldspar within pegmatite often shows gigantic perthitic texture visible to the naked eye. Pegmatite is essentially restricted to Barrovian Facies Sequence metamorphic rocks of at least middle greenschist facies, and often also intimately associated with granites intruding into such terranes. Worldwide, notable pegmatite occurrences are within the major cratons, and within greenschist-facies metamorphic belts. However, pegmatite localities are only well recorded when economic mineralization is found. Within the metamorphic belts, pegmatite tends to concentrate around granitic bodies within zones of low mean strain and within zones of extension, for example within the strain shadow of a large rigid granite body. Similarly, pegmatite is often found within the contact zone of granite, transitional with some greisens, as a late-stage magmatic-hydrothermal effect of syn-metamorphic granitic magmatism. Some skarns associated with granites also tend to host pegmatites. Aplite dykes and porphyry dykes may exploit pegmatite within wall rocks to intrusions and vice versa, creating a confused sequence of felsic intrusive apophyses within the aureole of some granites. Low rates of nucleation of crystals coupled with high diffusivity to force growth of a few large crystals instead of many smaller crystals. High vapor and water pressure, to assist in the enhancement of conditions of diffusivity. High concentrations of fluxing elements such as boron and lithium which lower the temperature of solidification within the magma or vapor. Low thermal gradients coupled with a high wall rock temperature, explaining the preponderance for pegmatite to occur only within greenschist metmorphic terranes. Metasomatic – Pegmatite, in a few cases, could be explained by the action of hot alteration fluids upon a rock mass, with bulk chemical and textural change. Metasomatism is currently not well favored as a mechanism for pegmatite formation and it is likely that metamorphism and magmatism are both contributors toward the conditions necessary for pegmatite genesis. The mineralogy of a pegmatite is in all cases dominated by some form of feldspar, often with mica and usually with quartz, being altogether "granitic" in character. Beyond that, pegmatite may include most minerals associated with granite and granite-associated hydrothermal systems, granite-associated mineralization styles, for example greisens, and somewhat with skarn associated mineralization. It is however impossible to quantify the mineralogy of pegmatite in simple terms because of their varied mineralogy and difficulty in estimating the modal abundance of mineral species which are of only a trace amount. This is because of the difficulty in counting and sampling mineral grains in a rock which may have crystals centimeters, decimeters, or even meters across. Garnet, commonly almandine or grossular, is a common mineral within pegmatites intruding mafic and carbonate-bearing sequences. Pegmatites associated with granitic domes within the Archaean Yilgarn Craton intruding ultramafic and mafic rocks contain red, orange, and brown almandine garnet. 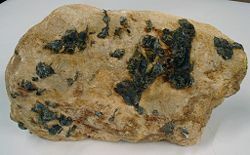 Tantalum and niobium minerals (columbite, tantalite, niobite) are found in association with spodumene, lepidolite, tourmaline, cassiterite in the massive Greenbushes Pegmatite in the Yilgarn Craton of Western Australia, considered a typical metamorphic pegmatite unassociated with granite. Pegmatite is difficult to sample representatively due to the large size of the constituent mineral crystals. Often, bulk samples of some 50-60kg of rock must be crushed to obtain a meaningful and repeatable result. Hence, pegmatite is often characterized by sampling the individual minerals which comprise the pegmatite, and comparisons are made according to mineral chemistry. Geochemically, pegmatites typically have major element compositions approximating "granite," however, when found in association with granitic plutons it is likely that a pegmatite dyke will have a different trace element composition with greater enrichment in large-ion lithophile (incompatible) elements, boron, beryllium, aluminum, potassium and lithium, uranium, thorium, cesium, etc. Occasionally, enrichment in the unusual trace elements will result in crystallization of equally unusual and rare minerals such as beryl, tourmaline, columbite, tantalite, zinnwaldite and so forth. In most cases, there is no particular genetic significance to the presence of rare mineralogy within a pegmatite, however it is possible to see some causative and genetic links between, say, tourmaline-bearing granite dykes and tourmaline-bearing pegmatites within the area of influence of a composite granite intrusion (Mt Isa Inlier, Queensland, Australia). However, it is not always easy to prove causative or associative links between granite and pegmatite. Pegmatites are important because they often contain rare earth minerals and gemstones, such as aquamarine, tourmaline, topaz, fluorite, and apatite, often along with tin and tungsten minerals, among others. For example, beautiful crystals of aquamarines and topaz can be found in pegmatites in the mountains of Colorado and Idaho. Pegmatites are the primary source of lithium either as spodumene, lithiophyllite or usually from lepidolite (Li-mica). The majority of the world's beryllium is sourced from non-gem quality beryl within pegmatite. Tantalum, niobium (rare-earth elements) are sourced from a few pegmatites worldwide, notably the Greenbushes Pegmatite. Bismuth, molybdenum, and tin have been won from pegmatite, but this is not yet an important source of these metals. Pegmatites can be classified according to the elements of interest or mineral of interest, for instance "lithian pegmatite" to describe a Li-bearing or Li-mineral bearing pegmatite, "Boron pegmatite" for those containing tourmaline, and so on. While difficult to be certain of derivation of pegmatite in the strictest sense, often pegmatites are referred to as "metamorphic," "granitic" or "metasomatic," an inference as to the processes by which the author beleves a particular pegmatite was formed. This is an informal classification mehod, as the origin and nature of pegmatite formation and genesis is still heavily debated. This page was last modified on 2 April 2008, at 14:01.